Hispanic foods have become a menu item of choice in more convenience stores, appealing to the tastes of Hispanic shoppers and other patrons wanting to try new items. Using freshly-prepared foods to attract Hispanic shoppers to c-stores has become a proposition with value. Dollars spent by Hispanic food shoppers will reach $86 billion in 2018, representing a cumulative growth of more than 28% and a CAGR of more than 5%, according to market research firm Packaged Facts. New items and spicier options debuted in Hispanic prepared foods last year. These fresh trends were found in 2015 by Emprendedora, a multicultural marketing firm in San Antonio. “In the last few years, we have seen more and more authentic, fresh, homemade food. In some areas of the country with the highest Hispanic populations, the days of fried burritos, fried chicken and hot dogs as the only foodservice options are gone,” said Sandra Gómez Obregón, chief of strategy and implementation for the firm. She cited Stripes’ Laredo Taco Co. as a convenience store leading the trend “that others are definitely following.” The taco company offers traditional fare with traditional ingredients, she noted, and newer fare like street tacos in many flavors such as pollo en salsa verde. The soft corn tacos fit in one hand and come in multiples of two, three or more. This is a great item for convenience customers on the go. Many retailers already offer one of the top favorites of Hispanic customers in their foodservice programs. Pizza was the No. 1 c-store prepared food in Mintel’s “2015 Hispanic Consumers C-Store Preferences” survey among those ages 18 and older. Pizza is popular because of Hispanic culture, which favors group meals and foods to be shared, according to Liz Heard-Castells, president of Castells & Associados and chief strategy officer of Los Angeles-based Davis Elen Advertising. Made-to-order fresh foods are big with this growing demographic, she noted. Offering eggs for breakfast in larger portions than the average consumer eats is important to the Hispanic diet, said Sylvia Klinger, owner of Hispanic Food Communications Inc.
Texas-based Kent Cos. has seen sales growth in its foodservice with breakfast burritos from the commissary, said Richie Rodgers, director of marketing. It’s important for c-stores to understand shifting consumer tastes, said Jake Beniflah, executive director of The Center for Multicultural Science. 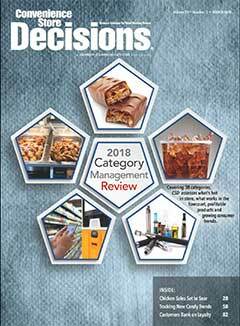 Based on a recent study the center conducted, sponsored by NGA, PepsiCo and others, this trend of new foods and crossover among foods is just beginning.